From a creator’s perspective, it’s no fun having your work copied. When you put in a lot of hard work to create something original only to have it ripped off by someone else who then presents it as their own, it can be disheartening. Some companies will even go so far as to rip off designers by copying their work and selling it on t-shirts and other merchandise! Not only is this kind of behavior morally questionable, but it can get you into serious legal trouble. If you’re copying the work of others, you’re setting yourself up for a lawsuit. It sounds like an awfully scary world. If you’re just starting out and looking for inspiration, you might be worried that you’re infringing upon someone. How can you be inspired without copying? We have copyrights and trademarks for a reason, but that doesn’t mean you can’t ever copy—copying is not all bad. It should make you feel better to know that we all start by copying. It’s how we learn. It’s how we learn language and how to speak! It’s the same way we learn any skill: we learn by copying the masters before us. It’s how we learn to draw, make music, and program. There’s nothing wrong with copying to learn. Did you notice the important part though? Copying to learn. I like the example of the Mona Lisa. If you want to get better at painting, by all means, try your hand at recreating the iconic piece of art—but do not publish this work. If you copy someone else’s work, that is a derivate work. It doesn’t belong in a gallery or showcase and it should not be published anywhere—this includes your website and all social media. Copy to learn, but do not publish derivative works. This is a very critical point: posting to Instagram, Facebook, or Twitter is publishing. You are publishing something on the internet. Just because it’s an app does not make it any less an act of publishing. This is not your work, it’s a derivative and a copy. You made it without permission, therefore you’re not permitted to display or publish this work (Related: Reposting & The Etiquette of Attribution). When can you copy? You can copy to practice. Copy to improve your skills. If you want to get better at lettering, have a field day and go through all of my work and copy it—for practice. Do not post this work because it is not your own. It is not your original creation. 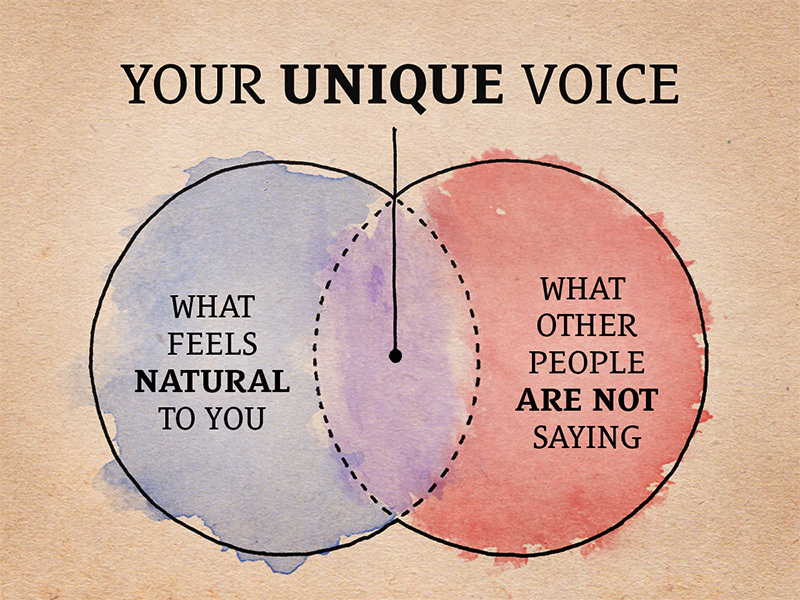 You need to develop your own voice and style before you start putting your work online. Yes, this includes any and all social media—these are not exceptions. We live in a very social world where we are encouraged to stream our consciousness and post everything that we do and everything that happens to us. Contrary to popular belief, not everything you make should be published. What you do privately for developing your skills is one thing, but what you publish needs to have your own spin on a style. My favorite example of inspiration without copying is from Erik Spiekermann. He’s a type designer from Germany. If he wants to make a typeface in a certain style, he will immerse himself in inspiration and examples of that style and then he will sleep on it. Here’s the key: the next day, he creates something from memory. Diversify your sources of inspiration. Don’t look at only one example of a style you like. Take in numerous examples to increase the diversity of what inspires you. Immerse yourself in inspiration and sleep on it. Take in the stimuli, and then shut it off. Sleep. Allow your mind to process. This will mix everything together into what I like to call a mental stew. It doesn’t taste like any one ingredient individually—it has its own unique flavor (Related: e116 How to Find Your Own Unique Voice and Style). Create from memory, not from reference. You’ve stored up a mental bank of inspiration—now pull from that! Don’t look at a mood board! Don’t have reference material in front of you! This is terrible advice that leads to direct copying. Can Derivate Works Be Published if I Attribute Them? No. This is a common assumption. Simply attributing who you copied does not give you permission to copy or publish their work. It is still an infringement. The only instance where this is acceptable is when you have expressed written content from the original creator. As long as you keep copied works private and do not publish, go nuts with your copying—I’d encourage it, even. Copying is a fantastic way to learn when you’re just getting started. Imitation is not the sincerest form of flattery when it comes to infringing upon the rights of another creator. Never publish copied works. Not on your website, not on Instagram, not anywhere. If you have any doubts, get permission. The most important thing you can do is diversify your inspiration. There’s nothing new under the sun, but that’s really only referring to general categorization. Don’t use that as an excuse to copy—there’s plenty of room for innovation. You can still have a unique style within those categories. Take in different media, try new things, combine styles, and test new tools. Immerse yourself in various sources of inspiration and recreate from memory. Stay creative.